Matches that occurred on our 2016 event XWA: On Stranger Tides! [VOTE] XWA On Stranger Tides MAIN EVENT: Rob Chapman vs. Declan James- SUPREME XWA TITLE! [VOTE] XWA On Stranger Tides: Jerod Barnez vs. Lx-Tim- GRUDGE MATCH! [VOTE] XWA On Stranger Tides: Garland Lynx vs. The Tarmagoyf- OPENING MATCH! 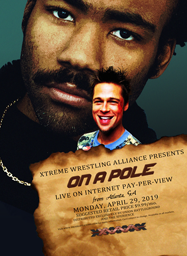 XWA On Stranger Tides: Michael Swift vs. Sean Young- ONE ON ONE! XWA On Stranger Tides: The Legion vs. Catastrophe- TAG TEAM ACTION!